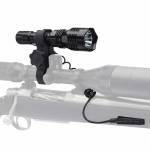 Illuminate your hunt with the ASF Predator light! This green LED hunting light illuminates the night up to 500 yards away. With a lifespan over 50,000hrs, adjustable beam, waterproof housing, and rechargable battery, this bad boy is the perfect tool for anyone who enjoys predator hunting! Lifespan over 50,000hrs Runtime 2.5hrs on HIGH mode 1-year warranty Smart Lume Led technology Mounts to scope or tactical rail 500-yard visibility Adjustable focus Waterproof Standard ..
lluminate your hunt with the ASF Predator XT light! 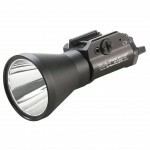 This LED hunting light illuminates the night up to 500 yards away. This 4 color deluxe kit include White, Red, Green, and Infrared LED modules. With a lifespan over 50,000hrs, adjustable beam, waterproof housing, and 2 rechargeable 18650 lit-ion batteries, this bad boy is the perfect tool for anyone who enjoys predator hunting! Lifespan over 50,000hrs, Runtime 2.5hrs on HIGH mode, White Light 1,000 lumens, 1-year warranty Smart Lume Led ..
Crimson Trace LG-489 LaserGuard for Smith & Wesson M&P Shield. Features Instinctive Activation, which allows the user to activate the laser sight by simply gripping the pistol in a normal firing grip. Easy installation, Fully user-adjustable for windage and elevation. Platform Laserguard Material Polymer Color Black Activation Location Front Activation Attachment Trigger Guard Battery Type One 1/3N Lithium or Two 357 Silver Oxide Batteries Installation ..
Look no further for your next weapon mounted light system. 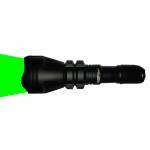 With both white and green LEDs, night time hog/predator hunting has never been easier. Long Range illumination gets you in range for almost every shot. 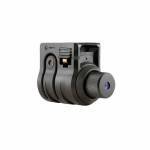 Includes scope and rail mounts, coil pressure switch and charger. High-output Cree LED light (Includes both White & Green LED modules) Long Range: White LED – 500 yards, Green LED – 300 yards Burn time: 2Hrs (White) 3 Hrs (Green) Windage/Elevation micro adjustment Picati.. 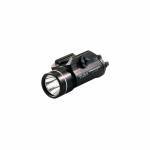 The Cyclops Weapon Mounted Green Laser Illuminator is a high power illuminator capable of reaching over 2,230 feet beam distance. 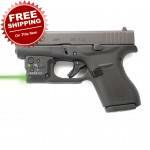 The beam adjustable between narrow and wide options and the green laser doesn't spook animals. Interchangeable push button or pressure pad intuitive and aviation grade anodized aluminum material is impact resistant. 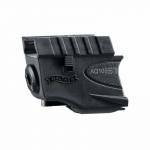 Weaver Mount BRQ Mount with rubber pads Velcro strap mount for barrel Two allen wrenches High end windage/elevation micro adjustment bracket.. 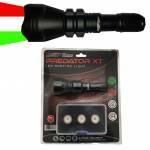 Whether it is hog hunting or predator hunting, you will see your target with the Predator LED Stabilizer Tactical Light. High powered Green 3-watt Cree L.E.D. 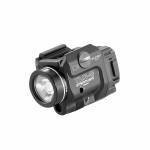 Illuminates up to 100 yards Included mounts attaches to Picatinny or Weaver rail 7oz. weight, 6” long Remote activated tactical on/off switch Water resistant Uses a single long life CR123 battery Rugged scratch resistant black anodize finish All aluminum construction .. This is a New open box item Propduct Type Lasergrips® Material Polymer Attachment Grip Replacement Activation Location Front Activation Sighting Factory Sighted at 50' Master On/Off Switch Yes Battery Type Four #2016 Lithium Batteries Laser Battery Life Approx. Two Hours Laser Output Up to 5mW Green Laser Activation Mode Pressure Activ.. This is a New open box item. 5mw, 633nm peak beam intensity Class IIIa laser 1/2" dot at 50' Pre-sighted in at 50' Adjustable windage and elevation Master on/off switch Dual side activation buttons 2 lithium batteries with 4+ hours of continuous use 5 year shelf life Includes small hex wrench Weatherproof Rubber overmold Dust shield Fits: Smith & Wesson J-Frame, Airlite, Airweight, Bodyguard, Chiefs Special, Centennial, Ladysmith, models 36, 37, 38, 49, 60, 63.. 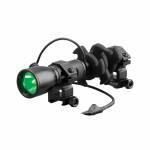 The TLR-1 Game Spotter is a long-range, game-tracking light featuring a shockproof, green C4 LED that produces a long-range beam. The green LED combined with a deep-dish parabolic reflector produces an intense hot-spot that provides long-range identification (375 Yards), and it does not spook varmints. Mounts to Picatinny and Glock-style rails, and includes rail locating keys for mounting to a variety of rails. The TLR-1 Game Spotters are made with impact-resistant construction of durable anodiz..
Streamlight's TLR-1 is an intensely bright, virtually indestructible tactical light that attaches/detaches to/from almost any gun in seconds. The rail grip clamp system securely attaches/detaches quickly and safely with no tools and without putting your hands in front of the muzzle. This model mounts directly to handguns with Glock-style rails and to all MIL-STD-1913 (Picatinny) rails, and it features an ambidextrous momentary/steady on/off switch. The TLR-1 is waterproof to one meter for 30 min..
500 lumens of power in a compact design, White LED and 640-660nm red laser, Low profile ambidextrous switch, Safe off feature prevents accidental activation Output: High - 500 Lumens Run Time: 1.50 hours Beam Distance: 131 meters Max Candela: 4,300 Battery Type: CR123A Lithium Battery Quantity: 1 Length: 2.15 inches (5.46 centimeters) Weight: 2.64 ounces (74.84 grams) Colors: Black ..
TruGlo Micro-Tac Tactical Micro Laser - Green Laser. Ultra-compact design and weighs less than 1oz. 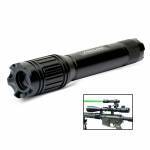 Utilizes a 520mm red laser and offers two laser modes: constant laser and pulse laser. Easy ambidextrous push-button activation for left & right handed users. 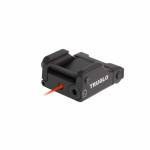 ..
TruGlo Micro-Tac Tactical Micro Laser - Red Laser. Ultra-compact design and weighs less than 1oz. Utilizes a 650mm red laser and offers two laser modes: constant laser and pulse laser. Easy ambidextrous push-button activation for left & right handed users. 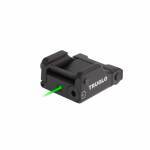 ..
TruGlo TruPoint Laser / Light Combo - Red. 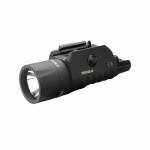 Laser located in flashlight housing for a more compact design. Ultra-bright 200 peak lumen flashlight. Powerful 650nm red laser (TG7650R). Interchangeable back plates for right or left-hand use Mounts to standard Picatinny or Weaver style rails Quick-detach lever for fast and easy removal without tools Operating temperature: 14F to 122F Remote pressure on/off switch also included .. The ultimate targeting system for your Glock G42. 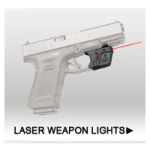 The laser sight is custom fit for the G42 firearm. Includes an Instant On ECR holster that activates the laser when drawn. Weighs Only .78OZ Instant-On When Drawn From Included Holster Choose from Constant of Pulse Modes Laser is Powered at the Maximum Legal Strength Laser is Visible up to 100 Yds in Daylight and 2 Miles at Night Low Battery Indicator Easy to Install and Sight In .. The ultimate targeting system for your XDS. 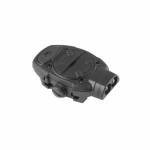 The laser sight is custom fit for the XDS firearm. Includes an Instant On ECR holster that activates the laser when drawn. Weighs Only .78OZ Instant-On When Drawn From Included Holster Choose from Constant of Pulse Modes Laser is Powered at the Maximum Legal Strength Laser is Visible up to 100 Yds in Daylight and 2 Miles at Night Low Battery Indicator Easy to Install and Sight In ..
Walther PK380 Red Laser Sight. Red laser sight fits the Walther PK380. Mounts forward of the trigger guard and under the barrel on the built in rail. ..
A low profile Picatinny mounted light that is ideal as a home protection light or as a backup to a primary illumination source. • Power button has one click low, second click high, hold for 2 seconds for primary light functionality • Set screw for Picatinny Rail mounting • IPX7 Waterproof Rating • Battery door opens with quarter-turn • Requires CR2016 battery (included) • Primary LED • Low-output LED • White/Red LED • All TBL are manufactured in the USA by Princeton Tec. ..
Quick detatch mount for a variety of light sizes. (Light not included) • Quick detach mount for illumination source or lasers • Large purchase pad for quick release • Accommodates 3/4in, .825in or 1in diameter light/laser ..